This was one recipe, that Mom would often prepare when I was growing up. Being from UP family, Parathas have a special place in our hearts and our kitchen. Mom would often make several variety of Parathas for us but two varieties of Parathas were prepared more frequently than others-Aloo ka Paratha and Pyaz Ka Paratha. Aloo Parathas were particularly served on Sunday, when Mom had little more time to spend in kitchen (she was a working professional) and Pyaz Ka Paratha was a quick fix arrangement for us that would keep us full for couple of hours at-least. It’s a no-brainer that Aloo ka Paratha with the spiced potato stuffing was my favorite, but Onion Paratha was no less. We, my sister and me, were served this hot Parathas, straight out from Tava into our plates. Mom would roll out these flat breads at such a brilliant pace that our plates would be refilled before we finished the previous one. Hot and crisp Parathas with spicy Aloo Bhujia, tangy Sirka were such a bliss that we always ended up gorging on more number of Parathas than our appetite could have it. Like any typical Indian family, my Dad’s dictum was nobody counts rotis served in their plate and we were supposed to eat as much as we wanted. I often ended up defying this dictum when rotis were served but with Onions Parathas I was more than happy to oblige. 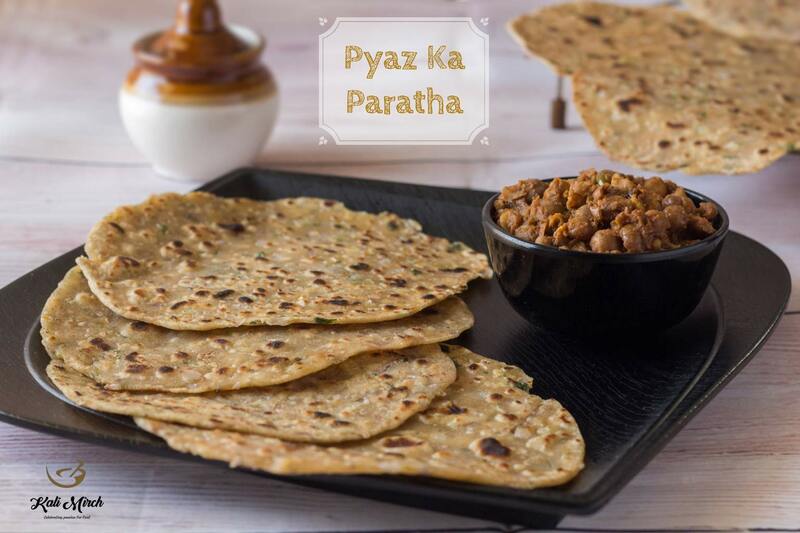 Unlike its stuffed counterparts, making Pyaz paratha is a fairly simple task and does not require any special skills. If you have been rolling out rotis/phulkas every day for your meal, you will pick up this recipe like a breeze. Let’s go through the recipe now. Add lukewarm water and knead flour into dough. Ensure you do not pour too much water at a time. This will make the dough too sticky to handle. Keep adding water in small quantities as you knead. Take a lemon sized balls from dough. You can take smaller or bigger sized balls too. You can roll into round Parathas or triangle shaped Parathas. Apply some Oil on palm and roll into smooth balls. We will make 4 balls and keep the dough aside. Heat a Iron griddle/non-stick tawa. When Tawa becomes hot, Put one Paratha on griddle. Slightly cook the underside for 15-20 seconds. Flip to cook from other side. You can see light brown colored spots. Smear the Parathas with Oil. Cook from underside (40 secs). Change sides again and smear Oil on other side. We will roast until Parathas become slightly crisp. The amazing part of the recipe is taste of Onions as it gets roasted. Remove Parathas from Tawa. Similarly, make other Onion Parathas. Never place the cooked Parathas in a Plate directly. It may get wet and soggy due to steam condensation. You can place it on top of a strainer, an Oven rack, or a bowl. This ensures Parathas do not become soft and wet. Wheat flour is composed of Gluten. When we knead dough gluten strings provide flexibility to the dough.